The crew and I are taking a little bit of time off so that we can sort through some documents and make them presentable for the next chapter of McGinty Chronicles. Looks like I got a bit of a head start on you. The fish are biting, life is good! We are more fortunate than some�Thomas W. Wyatt's name still stands clear against the elements and the passing of time. Simply stated: a lifetime ended. In the January winter, sunrise occurs in the mid West around 6:45 pm. I am glad that father�s last vision was of a sky filled with the richness of the brightest colors which held the promise of a peaceful rest in eternal darkness. His valor was lauded recognized by his military peers�and they wanted his family to know how they had honored him. To Mattie and me, he was our beloved Father, and he was gone. Born in New Jersey to an immigrant family seeking freedom from English military rule, Thomas Wyatt Sigley, as a young man, struck out to make his way alone, to seek prosperity and the promise of a brighter future in Illinois, where he farmed and raised a family of his own that continues in his footsteps. He embraced this country which offered him and his family final refuge and joined the right side of the cause to fight valiantly and victoriously for the freedom and human rights of the enslaved. I am proud of my father, Corporal Thomas Wyatt Sigley. In December 1891 a solicitation went unanswered�a very important solicitation since it was a notice to Father that his subscription to The National Tribune, Washington D.C would expire in January. The paper, according to the solicitation notice, was a treasure trove of information for the veterans and anyone interested in their affairs and in the Civil War. It claimed to be the only paper offering accurate history furnished by the men who �did the actual marching� and, probably more importantly, the newspaper featured sections that advocated veteran�s rights. 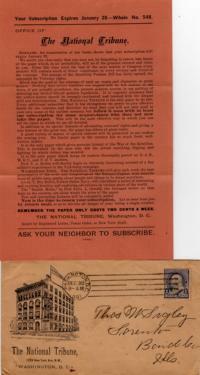 Despite the paper�s plea for continued support via subscriptions and its warning that there was �active hostility� and �soldier-haters� seeking to defeat pension legislation and even at its cost of two cents per week, it�s fairly clear why Father�s subscription to The National Tribune wasn�t renewed. 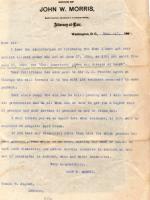 The other document, my father�s asthma remedy, was found in a jumble of some miscellaneous papers and I wanted to share it with you. "T.W. has not got a new coat yet." is one of the many bits of information offered in the miscellaneous clippings that remain from my stints as a newspaperman. Such a simple little statement, but T.W.�s neighbors probably found it fascinating along with the fact that "J.L. butchered hogs" or that the many so-and-so�s visited here-or-there. How else could we keep up with the comings and goings of our relatives, friends and neighbors? Today there are innumerable ways to keep in touch and informed such as this newfangled notion as blogging; in the 1890's, local and national newspapers were responsible for this. While I traveled the region as much as circumstances allowed, I also contributed to the information pipeline in the 1890s as a correspondent in the social notices pages of the Sorento Blade and the Farmersville Gazette. As you review this sampling of my work, keep a sharp eye for the activity of our family members, namely the Evans�, my sister Mattie, Father, and myself�referred to in the third person as J.L. Sigley or Logan and once in a while as Loge as you will see in future installments. A link to a small "teaser" selection of McGinty's writings. It was during this time that McGinty was born�I would like to remember who�s responsible for my pen name�not that it matters, really. My readers became accustomed to my columns and for many years supported my work. In retrospect, I�ll share this much with you�as Father�s health began to decline during the early spring of 1891, it was just a bit easier for McGinty to report on the ups and downs of T.W.�s condition, than it would have been for �me� to comment on the failing of "my father�s" health. There were two celebrations in Sorento, Illinois in October of 1891; Father�s 53rd birthday on the 14th, and a reunion for Old Civil War Soldiers which was attended by veterans from surrounding towns. After the reunion, he had slightly different versions of the stories he�d told us many times as he had for three days refreshed his memory of them by recanting them with the other soldiers who attended the reunion. One thing was obvious to us, the Civil War, then over 30 years past, was not only vivid in these veteran�s minds, but it had left an indelible mark of honor and pride in their lives. Father told me stories of his soldier friends and he graphically described the festivities at the grounds. When I recently came across this many-times reproduced clipping, those stories came back to life as it reported the reunion just as Father painted it for my mind�s eye. Father's name is listed about two-thirds down in column 1, among the soldiers' names from Sorento. Also, please keep in mind the name of the last name listed, T.W. Evans, as he will factor in, in future installments. By the end of his story I felt like a little boy again when Father showed me this treasure, but warned�under promise of punishment�to not even think about eating it. Unfortunately, we do not have the follow-up article as mentioned in the one above. 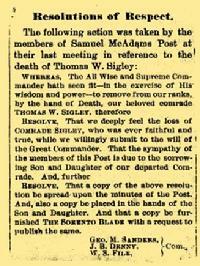 As I get close to the end of Father�s Civil War-related documents there are two that I thought you would find interesting too. 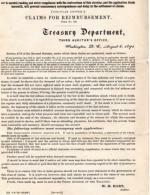 This first document, from W. H. Hart, Auditor from the Treasury Department�s Third Auditor�s Office, Washington, D.C. dated August 6, 1891 was of no personal value to us, since as we�ve seen that through Mr. Morris� office Father�s pension claim had been settled. However, this document demonstrates how well protected these pensions were. It states that these pensions, when paid to widows and children were not to be considered part of the veteran�s assets nor liable to be applied to the payment of debts, but would be paid free and clear to them. This letter also raises an interesting side to the Act we�ve been following, namely Section 4718 of the Revised Statutes. Clearly, not only were the veterans� widows and orphans the beneficiaries and therefore the targets of government agencies and attorneys to offer assistance (for a fee) in securing the pensions due them, but if these relatives did not exist, then the veteran�s doctors and undertakers were also eligible to avail themselves of the pension monies to receive reimbursement for their services. According to this "Circular (advertisement) Letter," if all conditions were met and proper documents were presented, the bills of all expenses of last sickness (as defined therein) and burial would be paid to the claimants. Make of this what we will�one thing is clear: when the Statutes were re-written and implemented, it was the Civil War veteran, his family and his financial well being that were at the forefront of the revision. I must admit that when I began this research I figured that I would be showing you a difference in line with the increase in the price of postage stamps since that time�obviously that is not the case and either we�re getting quite a bargain for the Post Office Boxes that we can rent today (where they are still available) or Father grossly overpaid for his, Box #21. A phrase quite common in the Sigley family�A necessary evil�quite well defines what the law firms of the 1890's became to the Civil War veteran. As in my father�s case, these men did not need any proof to receive their pension simply by virtue of their advanced age. If they had a further disability, the amount would be higher and they would need proof of their health status. Simply put, these firms, for a fee, as in Father�s case�ten dollars, became expediters in claims that could have easily been paid directly without further pencil-pushing nor cost to the veterans or their beneficiaries. Not all veterans where as fortunate as Father. Some, like poor Mr. James Masterson, died with their pension claim still pending and it was up to their families to plough through the paper trail necessary to obtain their pension. Why Father chose not to return the letter above as his affidavit that he had knowledge of Mr. Masterson�s upper respiratory conditions is left for us to think about. Anything from the widow Masterson�s claim being fraudulent and a means to obtain a higher pension amount to the possibility that Father never set eyes on the man, despite the Thomas Van Etten firm�s claim that he knew James Masterson intimately from 1876 to 1885 can safely be conjectured. Not unlike today when a lay person can obtain a divorce or resolve many legal issues without the help of a law firm�the Civil War veterans, either through strong solicitation and enticement or by personal choice to simplify the legal process of obtaining their pension�associated themselves and sought the counsel of law firms. Below is a typed translation of the above letter, however we do apologize for the omission of the name of the city. Though it looks like Dunlop, or even Douglas (as there is the nearby town of New Douglas), the original is unlcear and searches for something similar resulted in nothing that matched closely enough. From about 1876 to 1885 James Masterson, deceased, resided in the neighborhood of New ?? and Sorrento. He died in this county Feby. (February) 27, 1891 and had a pension claim pending which he had not completed and his widow is trying to complete the claim, as he left his family now, being very badly disabled the later years of his life. 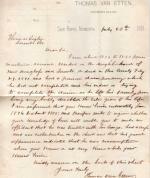 I am informed that you knew him intimately from 1876 to about 1885 and therefore write to inquire whether your knowledge of him will enable you to make an affidavit that he was troubled with his lungs, had a cough and was rather sunken in the chest and that his general appearance indicated that he was consumptive when you knew or at any time while you knew him. Kindly answer on the back of this sheet. ATypical Sigley Occurrence ~ or ~ How The More Things Change, The More They Stay The Same. Having established as of December 1890 that his pension was awarded at $10 per month with sufficient documentation to support this (please see the Chronicle installment dated March 9 and 16, 2009), I can still see Father�s face reddening and hear the ire in his voice in the summer of 1891 when he received these two documents. It is apparent that Mr. Morris�s office wanted further support of Father�s disability. According to the first document above, this support was to be provided in the form of affidavits from an officer or two comrades as to where and under what circumstances Father contracted his disease of heart�a ludicrous request and one impossible for any heart patient to fulfill. What is also apparent-no, what is quite obvious is that it was accompanied by a form letter which did not apply to Father�s claim at all. That letter requests a completed application, but Father�s pension was as of the letter�s date, already in place and being paid. Nevertheless, the true value of these documents is that this letter, wrongfully included, is full of interesting facts explaining to soldiers and sailors their rights under the new Act of June 27, 1890. Specifically, it is a follow-up solicitation to soldiers and sailors whom John W. Morris�s office had previously approached offering representation in securing their pension and how clearly it explains to them their rights under the new act. The last piece above, the envelope, was of further use to us than only conveying these two documents from the Morris office in Washington, D.C. to Father in Sorrento, IL. As with many other pieces of paper in our document collection, it was used to practice our penmanship. That it and the other two documents were not torn by Father in anger the day that he received them, is to our benefit and I am grateful for it. You Can Take A Sigley Out Of New Jersey, But. . .
A fire in 1921 in the basement of the Commerce Building in Washington DC resulted in the unfortunate loss of countless 1890 federal census records. Thankfully, with censuses from the preceding and succeeding decades and with our personal documents and letters, like the one below, we are able to piece together at least some of the family�s actions during that time period. Next in line for you I have a letter my cousin Ida, Mrs. C. P. Dickinson, wrote to Father in early January 1891 replying to his letter. I�ve read this letter so many times and have formulated several thoughts. Some obvious and some strictly conjectures on my part. Allow me to share those with you. Cousin Ida, at time of this letter, was 23 and was married to Clement P. Dickinson, a 36 year old jeweler from Belleville NJ, who would later work as a machinist like his father, C.W. Dickinson. In her letter, she tells Father about her stove accident and how he will see it in one of the papers. I have gone through many newspaper clippings (most of which I will be sharing with you in upcoming instalments) and it seems that stove and kitchen fires were quite common. Luckily Ida recovered and, apparently, was not burned, but only suffered from gas (smoke) inhalation. More interesting is the fact that while T.W. had been established in Illinois for most of his adult life, he obviously kept up with the goings on in the East coast by reading their newspapers. Those must have been local to Belleville as Ida questions him on his thought on the "town�s" improvement since he was there. 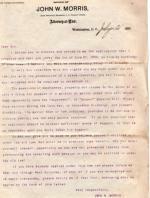 From the letter�s date of January 2, 1891, it occurs to me that Father wasted no time in letting his East coast relatives know about his good fortune, since he�d only gotten his pension award letter from Mr. Morris in December, 1890. Also, from Ida�s query, he did not tell them the amount of his Civil War pension. It warms my heart every time I read how my cousins wished Father could go back home to New Jersey if his pension amount helped him to do so. Having made his life in Illinois, Father did not entertain the notion, but that the offer was made so openly shows the closeness of our family even when so many miles apart. I don�t recall if I answered the letter that Cousin Ida mentions or not. Truthfully, in those days my hat ended up on many different hooks and I don�t even recall her letter to me. If I did not answer her, for that I apologize to her most sincerely and, once again, to you for my too-often lack of memory, but we�ve been through that already. Better than those two apologies, I would be much more useful if I left you today with advise in the guise of a simple request. Is there anyone waiting to hear from you? Whether you�re a Sigley or not, and by whatever means you have of communicating in the year that you read this�reach out to them and tell them you�re thinking of them. Oh, it was so long ago, but I remember Christmas in 1890 being very special. Just a few weeks earlier, Father received official notice from his attorney, John W. Morris, that his pension was being paid retroactively from June of that year. His service in the Civil War was to be rewarded with a monthly pension in the amount of $10. Of course the vouchers mentioned in the pension award notice letter from John W. Morris�s office are not available as Father surrendered them for payment of the pension. What does remain in our documents is the bill from the lawyer. Straight from the U.S. Pension Agency in Chicago, IL is the notice to Father that his attorney�s fee was deducted from that first lump sum payment. So happy were we to see his pension resolved that not one of us minded the one month�s fee that Mr. Morris charged for securing or as he put it, how he �got� Father�s pension under the Act of June 27, 1890. While $10 per month may not seem like a reason for such jubilation; it really was. This pension represented a sense of security for Father and a way for him to spend the rest of his life in a more comfortable and financially stable position. Again, while it may not seem like such a large amount, remember this was a long, long time ago and a much simpler time. 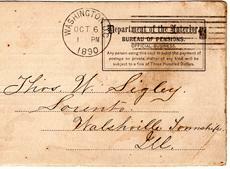 This was a time when an incorrectly addressed letter from the Department of the Interior, Bureau of Pensions in Washington, D.C. sent to Illinois, arrived safely. Not only was it addressed with only his name and (incorrectly) Palmer, IL, but it was opened "by mistake" and marked as such by the person who opened it, Benott Hailey. Mr. Hailey, realizing his error saw to it that Father was found, probably by his military identification as listed on the envelope, and forwarded the letter. At the risk of waxing poetic or ending this chapter on a melancholic note, it pains me that my younger relatives did not experience the simplicity of that time when $10 a month changed a man�s life and when a neighbor saw to it that you received your mail when the government mis-addressed it. As a young man in my early twenties, I was ready to sow some oats of my own. I worked as a laborer with the railroad, in a crew known as gandydancers and my job was to maintain a level and safe alignment of sections of track that would otherwise have vibrated out of place by passing trains. I also had the job of readying mail bags for pick up by passing trains. As you can see in this video clip, the job was fairly simple. The bag was secured to the crane on the side of the tracks near the station and tied in the middle to accommodate a swing arm operated by the mail clerk inside the mail car. As the train would pass by, the clerk would eye the position of the bag and position the catcher arm to the center of the bag, catch the mail and swing it into the car. The bags of mail were tossed onto the ground and were distributed to local post offices. Click here to see more information and photos of how this system worked. I�m sure by now you�ve noticed that I�ve embraced and make full use of today�s technology and that long past are the days when I stared at a keyboard that although reminiscent of my old typewriter was so strange and foreign to me. When I wasn�t working, I was a bit of a gadabout, cavorting with friends and visiting family. I eventually would make it back east to acquaint myself with family members who up until then were only names spoken by Father or scribbled in letters. But more of that later. Mattie, too was off on her own. With Grandma Evans gone, Mattie found work as a housekeeper and worked for several families. And good news came to Father concerning his pension from the war, due directly to the Act of 1890. 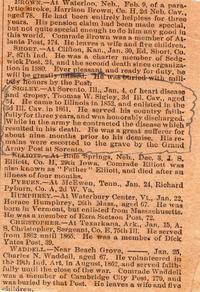 As described in last week�s installment, because soldiers were advised to use the condition listed on the pension table that most closely represented their own to determine their benefits, Father selected �Inability to perform manual labor for any cause� as he suffered from chronic diarrhea, piles and disease of the heart and set the wheels in motion to start collecting his pension. The two items below, each showing both back and front, are postcards generated by the Department of the Interior. 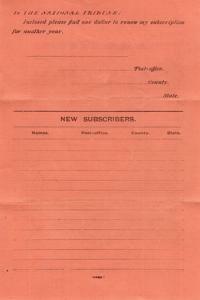 One is a blank registration form, directed to the Commissioner himself, Mr. Green B. Raum. The other is an acknowledging receipt of claim from the Commissioner. It would just a be wait and see situation before Father would begin receiving his compensation. While I'm gathering the information I want to share about my father, Corporal Thomas Wyatt Sigley's Civil War pension, I want to show you a few things that are helping me in my research. First is the Table of Pension Rates that is part of our family's documents from the treasured cigar box. From it you can see that it was prepared and published by John W. Morris, the Late Principal Examiner U.S. Pension Bureau, Attorney at Law, in Washington, D.C. His claim that he "makes the Prosecution of Pension Claims his Specialty" led me to do some further research on Mr. Morris. He published and entered this table according to the act of Congress in the year 1891 in the office of the Library of Congress. This table shows the monthly pension amounts allowed to soldiers and how pensions varied by disability and rank. The sections that pertain to Father are highlighted. As of the Act of June 27, 1890, and under the heading "All officers and enlisted men of the Army, Navy or Marine Corps irrespective of rank, without proving that their present disability originated during service", Father was eligible for a monthly benefit of $12.00 due to �Inability to perform manual labor from any cause'. This is the listed disability closest to his personal condition which made him, to the best of my knowledge, eligible for pension payments�advanced age. According to Mr. Morris, this information was first compiled in 1884, it was since revised and amended from time to time to incorporate changes in rate made by subsequent law, ruling and decisions. It is complete to date as per the law approved July 1, 1890. This revision was the most notable in the Federal pension law. After much lobbying by veterans' organizations, the Dependent Pension Act provided benefits for veterans who had served honorably if at some time they became disabled for manual labor and by 1906 old age was an allowable condition to receive benefits. Unfortunately for Father, by the time the country's economy and political differences improved and he became eligible, he would not live long enough to collect much of it. Alas, Mother was dead too and Mattie and I were over sixteen so the Federal pension did not add much to the Sigley family coffers. While researching the validity of the pension table document in our collection and of its author�s claims, we also came across this website which includes the contemporary advertisement in the Pension Table PDF�s first page featuring John W. Morris. The picture icon links you to Civil War Medicine (and Writing) - A blog on current research in Civil War-era medicine, Jim Schmidt�s own Civil War writing, advice on freelance historical writing, and comments on the goings-on at other Civil War blogs. This Civil War blog is well researched and expertly written and has been of great value to this chapter of the Chronicles. While it puts forth how Civil War soldiers and their lawyers helped shape future pension policies, of personal importance to our family is that it corroborates our assumption why Father�s pension came so late in life and so long after his service in the Civil War ended. Please be sure to see the treasure trove of Civil War information on Jim Schmidt�s "Civil War Medicine (and Writing)" website. Father�s personal pension documents will be my focus as this chapter continues. It�s mid-June and a letter arrived for my father from his sister Sarah from Belleville, NJ announcing yet another death in the family. 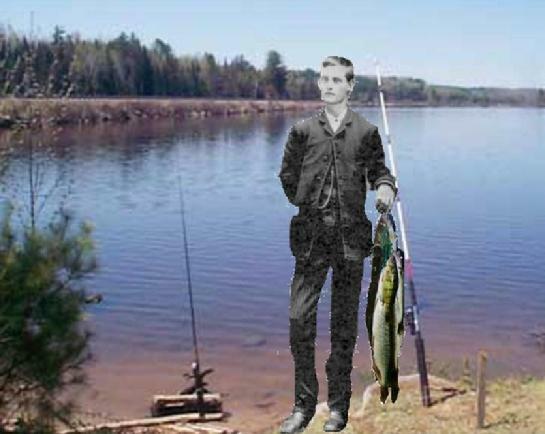 This time it was about Grandpa John, the very man responsible for the Sigleys being in this country. He left behind a legacy that continued to thrive into the 20th century, and, which I understand, still continues in the 21st, but that�s getting too far ahead of myself; we�re still concerned with the 19th. So, while Grandpa�s death certainly and sadly marked the end of our beginning in America, there is still much more to try to uncover from our earlier times and even more to reveal about the future. We are really just getting started. Aunt Sarah�s is seemingly rather a formal letter, as you�ll see by the signature, "Your affectionate sister, S.A. Fink". In it, besides sending word of her father�s death she describes an illness she herself suffered. Later in the letter, a reference is made to Alice and Arty, who are my aunt and her husband. I apologize, but I am not certain who Hannah or Jenny are. There is, in all the information gathered so far, at least one connection between a Jennie and a Mary (in a will wherein Mary names Jennie as one her beneficiaries). Mary, you may recall, was the name of Grandfather�s wife after Martha. While it is assumed the "mother" mentioned in this letter refers to Mary (which we believe it does), we do not know for certain whether the Mary and Jennie connection (in the above mentioned will) my team and I are currently investigating is the same Aunt Sarah mentions in her letter. Unfortunately, before we were able to decipher this little stumbling block, the time came in our chronicle to present this chapter. Once we have ironed out the details, we will revisit this question and let you know. Following the actual letter, is a typed translation. Rest in peace, Grandpa John. Editor's Note: In researching old world diseases, and by sounding out the spelling of Sarah�s condition [eiricipilas] mentioned in the letter, we came across Erysipelas, which is a contagious skin disease, due to Streptococci with vesicular and bulbous lesions. 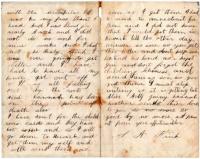 Also, for further information, click here to read about a documented 1883 case in six short pages. By the time the next federal census was taken in 1880, numerous changes had taken place within our family. My Aunt Sarah (Fink�spelled Finck in this census) had been widowed and she found work washing and ironing to raise her two children, my cousins, George and Ida. Notice who Aunt Sarah's neighbors are, my grandfather John and his wife, Mary. Aunt Alice (McCluskey) and her husband, Arthur, who was now working as a hatter, had been blessed with four additional sons; William, Alfred, Frederick and James. Notice, once again, how differently the name is spelled on this particular census. Also, you will remember, from several past mentions, Uncle John, we assume� the first assumption being that this information pertains to my uncle�was living and working in the coal mines in Pennsylvania until his death sometime before this 1880 census. 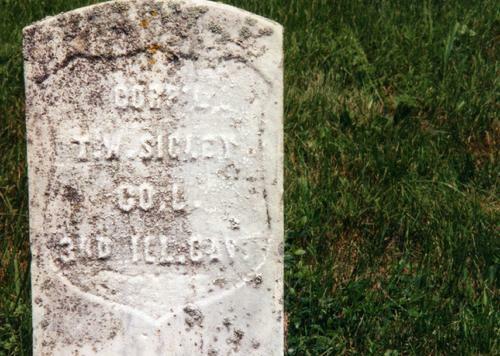 His namesake, my cousin John W. Sigley, III, who, at the age of 14, worked in the coal mines. He lived with his mother, Elizabeth (Betty, in a previous census), sister Emma, step-father Edward Clark, and several borders who also worked in the mines. Even though this particular census was presented once before, it merits showing it once again, to keep that (alleged) branch of the family included in the chronicles. My sister Mattie, now 12, remained in Walshville, living with our grandmother, Ann Evans. Grandma, too had become a widow and she also had in her charge a young boy named George Kitchell, who in 1880 was aged 16. I do not recall with great clarity what the exact circumstances were and how she came to adopt the young boy but there are varied speculative scenarios. The most obvious being that his parents, shown in the census of ten years earlier, may have died. He also had an older brother and three younger sisters, two of whom were twins. No further information is available so we therefore assume the parents� death resulted in the adoption of the children to families that may have given them their last names, thus making any further research impossible. Grandma thought it best Mattie remain with her, while Father and I fended for ourselves, sadly piecing our lives back together after the loss of my mother, Elizabeth Jane. Mother had given birth to a baby girl, Anna Elizabeth, on April 2, 1873. She was named for both Mother and Grandmother. Tragically, five days after giving birth, when, lighting the stove, Mother caught on fire and died from the severe burns. While still mourning Mother and tending to family matters, we suffered through yet another loss. At just about five months old, on August 29, 1873, baby Anna Elizabeth joined her mother in Heaven. While we Sigleys cried and suffered our great losses, in a town called Bois D�Arc, in Illinois, the O�Connor family was beginning to flourish. Michael O�Connor, officially listed as having been born in Iowa, has since taken a wife, Laura Gillworth and set up home. By 1880, Michael was farming, much like the majority of the population in the state of Illinois. The household bustled with the patter of the little feet of two year old Charles and the happy innocent gurglings of his sister, 3 month old Mary Elsie. While, seemingly, life continued harmoniously for the Sigley�s, both here in Illinois, Pennsylvania and in New Jersey, the country�s overall readjustment to normalcy after the Civil War was a tumultuous one. Perhaps the beginning of the ongoing unrest had its roots in the months just prior to the war�s end with the creation of the Bureau of Refugees, Freedmen, and Abandoned Lands, also known as the Freedman�s Bureau. The purpose of the Freedman�s Bureau, in an attempt to bring order back to the South, was to provide freed slaves with food, medical care and resettlement, and was also in charge of establishing schools. The bureau was also responsible for the dispersal of the 400,000 acres of land General Sherman�s Special Field Order No. 15 was to provide for freed slaves. The abandoned rice land across Georgia and South Carolina was divided into 40-acre plots and later, the army was ordered to provide mules to the freedmen. This became known as "forty acres and a mule". The Freedmen�s Bureau was not without opposition. Once the Civil War had ended, several southern states passed legislation and created Black Codes. On a state to state basis, the codes gave the right to more firmly legislate just how free a free black man could be; where he was allowed to live, issuing curfews, and mandating that blacks work as domestics or agricultural laborers. To add insult to injury, Lincoln�s successor, Andrew Johnson, reneged on upholding the slain President�s reconstruction plan and was unsupportive of the Freedmen�s Bureau, but in favor of southern white rule over local governments. He, of course, faced opposition from Radicals, a small group of Congressional Republicans who wanted rights for black, to have the Emancipation Proclamation upheld and the black man�s right to vote. The Radicals, in turn, were opposed by the Moderates, who wanted limited civil right for blacks. In the fall of 1865, Andrew Johnson reconsidered the conditions he had earlier placed on wealthy Confederate planters in that he required them to ask for clemency in written letters addressed to him. If pardons were not met, the planters faced losing the right to vote, holding office and having their lands confiscated. Consequently, blacks who had taken possession of the abandoned fields, were forced into surrendering the land, or in order to remain, had to sign a labor contract with conditions much like slavery. This sharecropping allowed a black farmer to work a portion of the land and pay for the supplies purchased throughout the season with his yields, often leaving him to walk away with nothing or in a deficit situation. In March of 1866, with the aid of a Republican unification, against the "white man" Democrats, the Civil Rights Act was passed by Congress, in spite of Johnson�s veto, who, outwardly had no intention of protecting the freemen from the increasing violence in the south between the two parties. After gaining strength in the House, in March of 1867, the Republicans were able to override Johnson�s veto and blacks had the rights and privileges of full citizenship and the Black Codes were eliminated. However, some states still instituted less severe codes. On July 28, 1868, the 14th Amendment had been ratified. Between the time the bill was first passed in June two years earlier and its ratification, a supplementary Reconstruction Act was passed, giving blacks the right to not only vote, but become active in governmental affairs. I am getting ahead of myself, but that would actually take another 9 years after the South�s tiresome attempts at repealing, the Amnesty Act being passed in 1872, which returned political rights to Confederate soldiers; an economic crash in 1873 and finally to the election of Republican President Rutherford B. Hayes in 1876. The promise of the Republican party was to end Reconstruction and in April of �77, Union troops were withdrawn and Reconstruction ended. Thus, a country whose geographic and demographic differences had formed ideals that caused it to sever from itself and whose economies were changed forever at the dearest cost�the lives of its young men�found its way back to a guarded sense of peace. As history was being made, and while all around them was turmoil and uncertainty, the Sigleys, like families across the United States worked, raised their babies, and carved out their niches in life. The Sigley household in Walshville was a happy one. Father worked our farm and Mother tended to my sister Mattie and me and to her household concerns. Then, a summer day in 1872 brought us joyous news. And a little more than a year later tragedy would befall us. Editor�s note: I must cite the following website for the historical information used in this week�s installment. It is an intensively written site with so many facets, so may embedded pages; the information I included this week only just scratches the surface. Please click here for more detailed information. 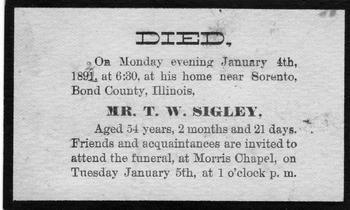 Life continued for the Sigleys of Walshville, Illinois. Two years rushed by when news came of a new addition to the family. In the late spring or 1868, on May 25, my sister Martha Alice Sigley was born. She quickly became affectionately known as Mattie. Shown here (with yet another of those rampant discrepancies) in the 1870 census, the four of us are listed, but with my and Mattie�s birth dates off by two years. I assure you, I was born in �66 and my sister in �68. To remind you and keep you abreast of the family history timeline, after the Civil War, as you know and as far as we can tell, Uncle John became a miner in Mifflin, Allegheny County, Pennsylvania. Please refer to the November 10, 2008 chapter for the 1870 census for this information. My two aunts remained with their own families on the east coast. In Belleville, NJ, my Aunt Sarah Ann, who was now a young woman of 25 (in the year concerning this installment-1868-and not the 1870 Census) was married to Silas Fink, aged 28, who worked as a carpenter. The young couple had two children; my cousins, George, who was born the same year as I was, and his sister, Ida, who, coincidentally, was born the same year as my sister, Mattie. Also in Belleville, NJ, Aunt Alice, now 26, (again in 1868) was busy with her own family, husband Arthur R. McCluskey, 33, and their brand new baby boy, my cousin John. As you can see by the time this 1870 census was taken, their second son, Arthur had been born. Arthur Sr. would hold many and varied positions (including, hat making and serving as postmaster at his local branch of the United States Post Office) in his 70 years and currently, in 1868, at the age of 31, he was a saloon keeper. Author Commentary: While reading over this instalment, it occurs to me when I mentioned my Uncles John and Arthur that their positions of miner and postal worker, respectively will also be taken up by future members of our family. Read previous Chronicle installments (October 6, 2008 - January 26, 2009) here.